5 factors in choosing the best posture grid. "What's the best posture assessment grid for my practice?" Wall mount posture grids and door mount posture grids have the advantage of taking up zero floor space. The portable posture grid is free-standing, and the support system requires about a 10" clearance from a wall. 2. Is durability and material a factor? 3. Is it important to accommodate all body types and sizes? The wall and portable grids both stand about 7' tall and 3' wide, making them perfect for your tallest and widest subjects. The door grid is slightly smaller in height and width. Created as a space saver, it will accommodate just about everyone, though you may lose detail on some clients. 4. Will you use the posture chart in your office or at events, both? If you plan to take the posture analysis grid to screenings, the portable grid is ideal. It's a compact, self-contained, lightweight unit that sets up in seconds - and travels in the included carrying case. 5. Is price an important factor? 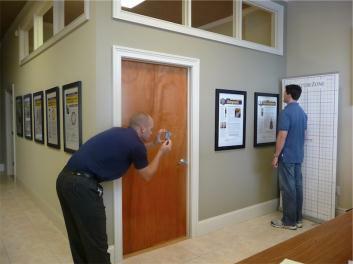 The door and wall mount grids are the least expensive options available. With the wall grid being the most popular due to durability, size, and price.